Inscribed on the back of the ‘Salvator Rosa’ frames with inventory number from their original Roman collection; From a private collection, Freiberg-im-Breisgau. 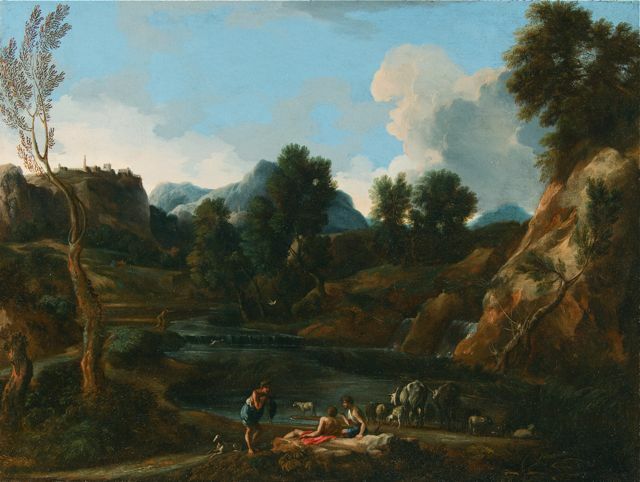 Most of Gaspard’s landscapes were undoubtedly acquired as pairs, but these have usually been separated, so this is a rare instance. Gaspard’s association with his brother-in-law, from whom he leatn the rudiments of landscape painting, was a great advantage to him, and he became known as “Gaspard Pussino”, and a commonplace in the interior design of the eighteenth century. The view that he has of his beloved Campagna (and he had houses at Tivoli an Grottaferrata) is more intuitive than that of Nicolas, and less dependent on an architectural framework. 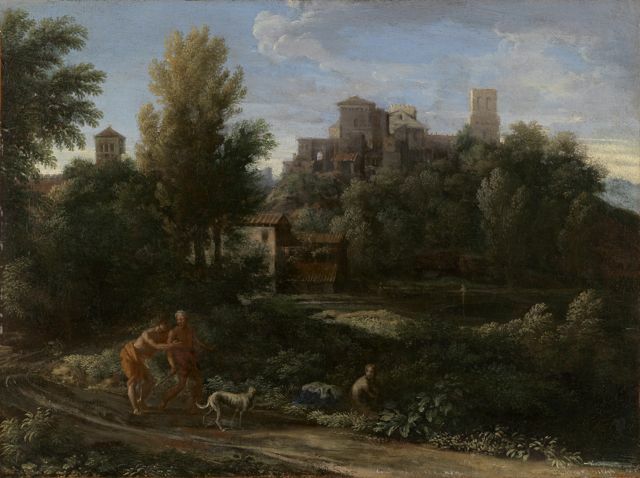 It is particularly apposite to have a couple of Nicolas’s landscapes, done for Carlo Antonio Dal Pozzo, in this exhibition, for comparison: Gaspard has in many ways a more instinctive response to the countryside, and his sensitivity towards natural forms evolves accurately from his use of chalk in making studies on the spot, as in the View of San Lorenzo fuori le mura in Dusseldorf ( exh. cat Gaspard Dughet und die idea;e Landschaft , Kunstmuseum, Düsseldorf, 1981, nos. 11, 12). 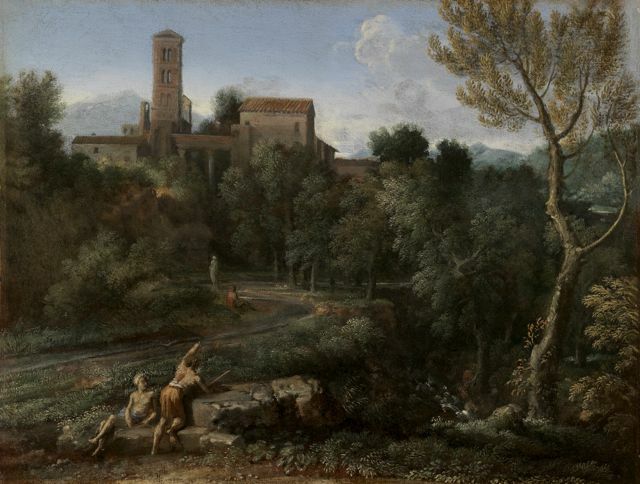 As is usual, there are a number of pentiments: Dighet worked on the profile of the trees and the architecture several times, so that the view becomes an idealized reminiscence of the Italian scene, so that for generations of would be travellers this was the image of what Italy’s nature represented. His buildings are reminiscences rather than actual views: the tower and portico are drawn from San Lorenzo fuori le Mura, the tower in the other painting recalls the Torre delle Milizie, behind Trajan’s Forum. But he worked wonderfully with the ellipses of the road and the pool, and the incidence of sunlight on the differing foliage and rocks. 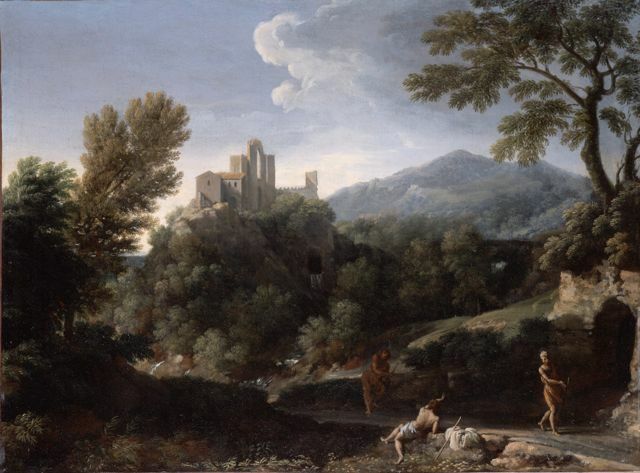 The buildings at San Lorenzo provided a number of other reminiscences for Gaspard: the design of the other landscape is also echoed in a landscape that formerly belonged to Roger Fry (Marie-Nicole Boisclair, Gaspard Dughet 1615 – 1675, Arthena, Paris, 1975, no. 401, Fig 436, location unknown; canvas, 36,9 by 45 cm), which has a similar composition but different figures.